writing | D.K. LeVick's "Writing in the Woods"
In studying literary works, written in other languages, (and there’s no book this is more true of than the Bible) there is always the question of translation and interpretation. I’m very conscious and careful with researching words (even simple words) to ascertain the real meaning and ‘feel’ of what is being said or conveyed by the writer. Translators and commentators choose the interpretation they personally feel is “best”. But, translators are human – have biases – preconceived ideas – and cultural backgrounds that influence their selection. To study honestly and faithfully requires looking at multiple commentaries and interpretations, and then, most times I go back to the original texts and work through the various possible definitions, to select the one I “feel” is best. Of course, what I “feel” is best may not work for someone else. Words written in one language don’t always have an equivalent word in another language. Worse – even when they do – there could be multiple words or meanings attributed to that word. The key of the translator is to select the proper meaning. Or making too much of it? Okay – let’s take a look at words – all in English alone – without any translation involved. 18) Upon seeing the tear in the painting I shed a tear..
Those are some simple examples. Think of a language that has only a few words and uses no vowels (Hebrew) to describe everything. How does the translator decide what is being said? To give you an idea, let’s look at a language that has a lot of words (English). Surely, with so many words, it must be clear what is being said when one is used – right? After all, it has so many words to choose from – right? It’s easy to understand UP, meaning toward the sky or at the top of the list, but when we awaken in the morning, why do we wake UP ? Why do we speak UP and why are the officers UP for election and why is it UP to the secretary to write UP a report? We call our friends UP. We brighten UP a room, polish UP the silver; warm UP the leftovers and clean UP the kitchen. We lock UP the house and fix UP the old car. Those are the general usages. At other times this little word has real special meaning..
To be dressed is one thing, but to be dressed UP is special..
A drain must be opened UP because it is stopped UP. We open UP a store in the morning but then we close it UP at night. We seem to be pretty mixed UP about UP! Well, to be knowledgeable about the proper uses of UP, look UP the word in the dictionary. In a desk-sized dictionary, it takes UP almost 1/4th of the page and can have UP to about thirty definitions. When it threatens to rain, we say it is clouding UP – but when the sun comes out we say it is clearing UP. When it rains, it wets the earth and often messes things UP– but when it doesn’t rain for awhile, things dry UP. One could go on and on, but I’ll wrap it UP, because my time is UPso……..it is time to shut UP! Now it’s UP to you what you do with this information when you read something. It’s been a year of silence from me – and for that I apologize to each of you. A lot has happened during that year – the world is rapidly changing around us and Wallenda walked across the Grand Canyon! (Check out my previous blog “The Spirit of Blondin lives in Wallenda”). I’ve spent that year working and laboring heavily on my latest novel and I’m happy to announce: IT IS FINISHED! Available from Amazon, Barnes & Nobel, Spring Arbor and the author; available in print and ebook on various formats. Was Jesus of Nazareth truly the Son of God? A clay tablet from the 1st Century is found in the ruins of a village in Israel, with writing on it—from the 21st Century! Solving the mystery of the Pyramids, along with a unique form of gold found on the moon during the Apollo 17 mission, and the Zodiac Constellations—a group of scientists and archeologists uncover a time-travel corridor—to the year 30AD. Is this for real? Or is it all a ruse to hide a terrorist plot planning massive mayhem and destruction? The Department of Homeland Security wants to know. One determined person, along with an avowed atheist, journey back to 1st Century Israel to find the evidence of who Jesus really was. Was he a man with his own agenda? Was he a deluded prophet? Or was he the Son of God? An uninvited traveler journeys with them – bent on a private mission of self-justification and revenge. What they discover and reveal, will not only change their lives—but will impact the course of human history forever. The book is actually two volumes in one cover. 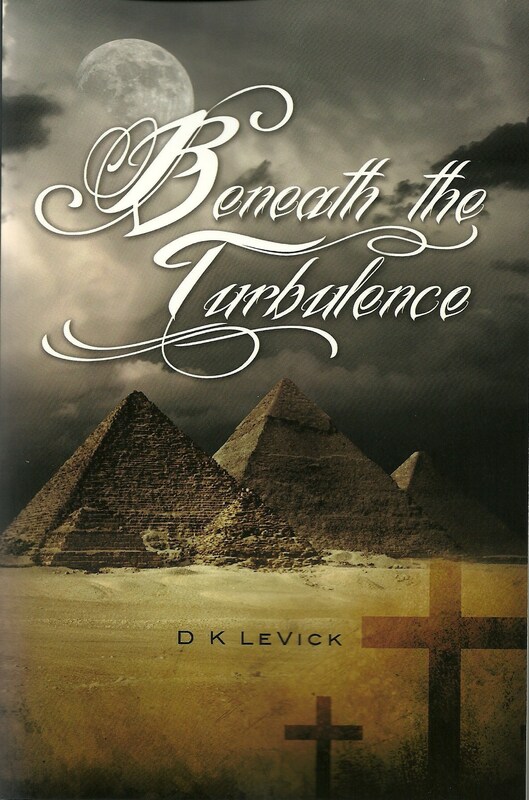 Volume One, titled “The Journey” describes how they journey back in time to 30 AD. Volume Two, “The Journal” details the events that follow in Egypt and Israel after they arrive in the 1st Century. …five young men not only encounter harrowing danger in the forbidden Niagara Gorge, but must confront the swirling illusions of the world they knew – changing their lives forever. Living in the City of Niagara Falls in the early 1960s, winters were simple for teenagers – like snowball fights and warm-ups at “Ol’ Gordy’s” general store, and arguing over his “wall of pictures.” It’s a ritual—sipping Cokes while studying the old photographs … listening to Ol’ Gordy’s tales..and dreaming about the daredevils of old. Then, on a frigid February morning, all that changed. An ice ball to Kevin’s face, and a funny looking picture, snatched from Ol’ Gordy’s wall, sets in motion a journey from which they will never recover. Despite Ol’ Gordy’s warnings (or perhaps because of them) that, not only is it extremely dangerous, but against the law, they secretly vow to venture forth and walk on – the ice-bridge of Niagara Falls. 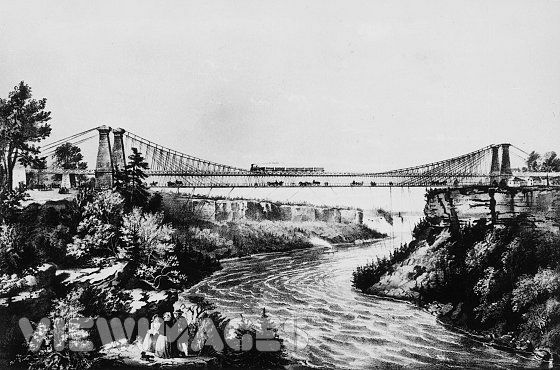 The ice-bridge of Niagara Falls – an aberration of nature—steeped in history – fraught with tragedy – challenged through the ages, by daredevils, bootleggers and tourists alike – lures them from the world they know into the depths of the mysterious Niagara Gorge. As in a time machine, they enter an exhilarating bygone world of impassable rapids, massive frozen sculptors and unassailable walls of ice. 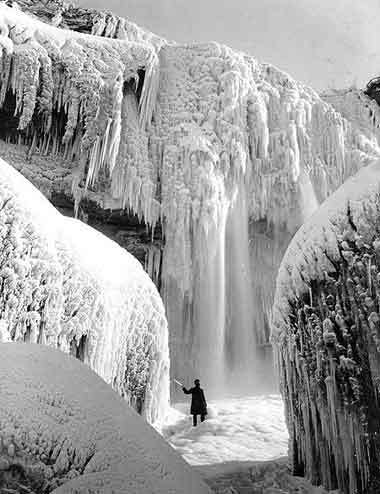 Coming face-to-face with the mighty Falls itself, from the bottom looking up, as it proclaims its dominion over them, they find themselves in a struggle of life and death with a Niagara they never knew existed. Peeling back time, along the way we encounter others, who had made their own journeys across Niagara in eras gone by. We’re there when the ‘Hermit of Niagara’, living on top of the mighty Falls itself, finds his destiny in becoming one with the water. Years later, we stand in awe on the day Niagara stood still and explore a riverbed never before walked on by man – until the water returns – sealing the mystery of the flute. We follow the journey of the feather, and witness slavery through the eyes of a runaway slave girl, as she rides the ‘Underground Railroad’ – seeking to find the bridge to freedom and paying the fare to ride that train. We march to the beat of the drum and the chant of the the tom-tom, as nations clash and cultures collide when the journey of a British drummer boy converges with that of a young Iroquois brave at the brutal and bloody “Devil’s Hole” massacre. 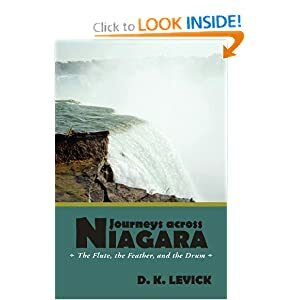 ‘Journeys across Niagara’ (previously titled: ‘Bridges -a Tale of Niagara’ and recipiant of the Readers Favorite 2011 Silver medal for General Fiction YA), is much more than a simple tale of camaraderie and adventure shared by young men. It a tale that is rich in both historical fact and fiction, weaving a series of unique historical events, in a twist of mystery and revelation, with a group of 1962 teens, caught up in the complexities of a changing world around them. While each struggles with his own inner demons and angels – together they face the demons and angels of the Niagara Gorge. It is my hope that you enjoy the journeys, and that you hear the crack of the ice, while feeling the tremor beneath your feet travel up your loins, knowing the mighty Niagara is reaching to claim you as well. ‘Journeys’ is a kaleidoscope of adventure and history, exploring the questions confronting people of all ages and from all times. The earth is forever, and we’re just visitors—and only for a short time at that. By the time we begin to understand enough about the world to ask the right questions, our visit is over, and someone else is asking the same questions. As the saying goes “the devil’s in the details”. When, writers of historical fiction, put words to paper, they bear the responsibility to transpose their readers to the time period their story relates to. This doesn’t mean telling them it’s 1776 – it means transporting them to 1776, making them feel it, live it, and be a part of it – having them jump up and march along with the fyfe and drum. If only done on the macro level, the characters are superficial and transparent. The reader doesn’t feel authenticity and sees through the ruse. To lift the characters off the pages and bring them into the minds and hearts of the reader, the writer must work on the micro level—down in the trenches – with the details. And, here he must tread carefully, for it can easily be overdone. Too many details are overpowering and will bog a story down quicker than a hippo wallowing in molasses. Inserting a few carefully selected details, in a natural way, so as not recognizable as being inserted, will unconsciously, allow the reader to live them. 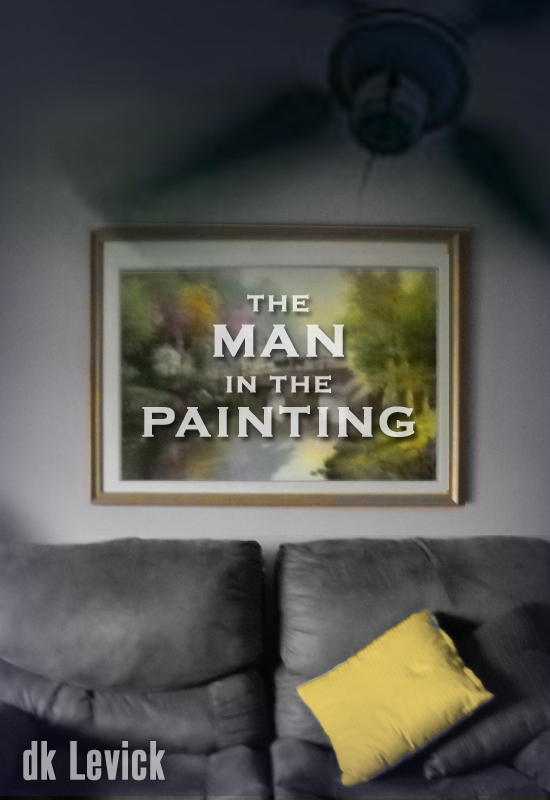 This is where the writer’s art comes in to play, weaving the facts and substance of the era into the spirit and essence of the story, putting the reader into the story’s setting as witness to the action. For every word of detail the writer puts to paper, a hundred words were researched, reviewed and revised. Each sentence represents hours of background investigation, study and learning about the times, people, environment and cultures of the era. If a writer’s passion is the blood flowing through his veins – then research is the muscle that forms his flesh. “To where do we go?” the writers asked. 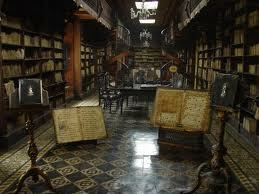 They went to the libraries and to building personal acquisitions of books and writings. Yes, long, hard, tedious work, not to mention, costly but worth the effort and cost. Today, all that’s changed, writers have the advantage of the internet. Call up any subject or key word and information is immediately at your fingertips. Images, words, histories, background, essays and opinions—lots of opinions. This is a huge advantage for the modern writer, but I also see a snare lying in wait for us. As wide and as deep as the internet is, it only coughs up what someone has put in it. And those things are repeated – over and over. The internet fools us into thinking we can click on any subject and then, magically and instantly, we are ‘well informed’ and ‘all knowing’ about that subject. It has the potential to ‘Wikipedia’ an entire population, on a global scale, with a ‘one-click’ mentality, regarding any particular subject. That’s one scary thought! The same, singular knowledge and information is put out and repeated to all who punch in a keyword or subject and most inquiries stop at that level. Much of this information has already been filtered and is steeped in ‘opinions’, before we ‘surf’ through it, filtering and discarding along the way. We, too easily, fail to genuinely dive into the heart of the matter, as true research demands. With enough repetitions and enough people reading the same things without rebuttal and opposing views and insights, we begin forming a global community of keyboard punchers who think along the same lines. And we then put our faith in it – “I read it on the internet, so it must be true.” There is a great risk of an unconscious ‘dumbing down’ of the entire world concerning any given subject of history – like-minded regurgitating with like-minded. Understandings about people and events can easily become condensed down to a singular ‘common’ or ‘general’ opinion, and we all know, there is nothing ‘common’ or ‘general’ concerning people. People are unique, diverse and always at emotional states with one another, whether loving or hating one another. And history is nothing more than a reflection of those people and those emotions. And make no mistake about it, we must fully understand and know all the details of history or the past will overtake the future. Think for a second, what power true censorship would have over this medium. The world’s understanding of history would be revised and reshaped to conform to the political or social designs of those doing the censoring. This isn’t fantasy or paranoia talk, for we know all too well that such things have happened down through history by governments, religions and organizations burning, rewriting and revising history for their own purposes and agendas. It’s not inconceivable or preposterous to think it could happen with the internet and we mustn’t be complacent– for there are governments, around the globe, imposing censorship and monitoring the internet as I write. True research goes beyond the internet and dives into the heart, fiber and cellular DNA of the matter. We, as writers, owe it to our readers and to those who went before us, to embrace research with both arms wide open, welcoming the joy of bringing history to life. “To where do we go?” the writers ask. 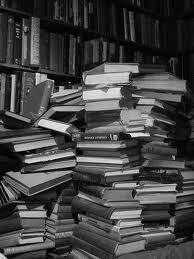 We go to the libraries and to building personal acquisitions of books and writings. Yes, long, hard, tedious work, not to mention costly but worth the effort and cost. Gee – I guess not all that much has changed after all. With those words, Peter climbed over the side of a boat, tossing and turning in rough seas, and walked on water! It was a new beginning for Peter. Peter was a fisherman. Uneducated, rough – living a hard life in a hard country at a hard time. His life changed and he became one of the most honored men in Christian (world?) history. Why? Because he dared to step out of the boat – to take a step that defied logic – nature and life itself. 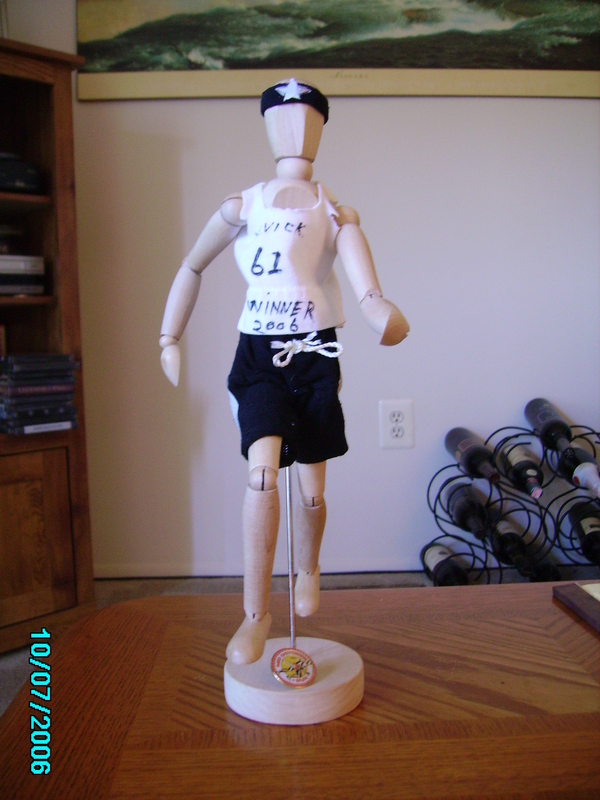 In today’s world of the shifting paradigm within the publishing and writing world – Indie authors are Peters. They’re stepping out of the boat – they’re walking on water! The publishing world is sitting in the boat saying it’s not possible – you can’t do that – you’ll sink and perish! Then when they see it happening, they say “It’s not real! It’s a ghost – an apparition – a mirage.” And they tremble with fear. Hello all my fellow Indie authors! “Come on, don’t be afraid.” Let’s step out of the boat. “Ya wanna walk on water?” Fun, huh? What is peace? and from where does it come?